Using JetShear heavy oil producers can meet pipeline viscosity requirements using significantly less diluent. Heavy oil blend is delivered from the production facility or terminal. 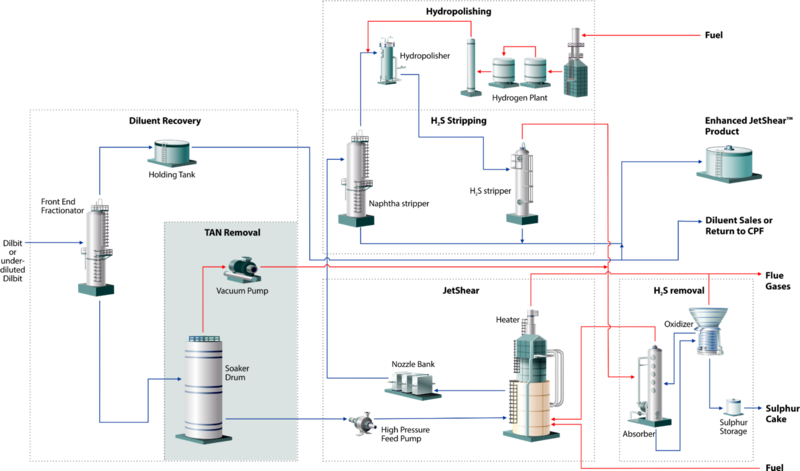 The initial processing step separates the light ends using simple fractionation. Light ends are routed around the plant to be recycled back to the production facility or to become part of the final sales blend. The stripped heavy oil is sent to the core JetShear module, heated to just below thermal cracking temperatures and pumped through proprietary jet-nozzles where cavitation and mechanical shearing occurs. The upgraded product is then cooled and sent to the sales tank or to blending prior to sales. Higher severity treating conditions within the core JetShear module result in higher viscosity reduction and diluent avoidance. Enhanced JetShear adds a processing step to remove olefins with the naphtha cut. 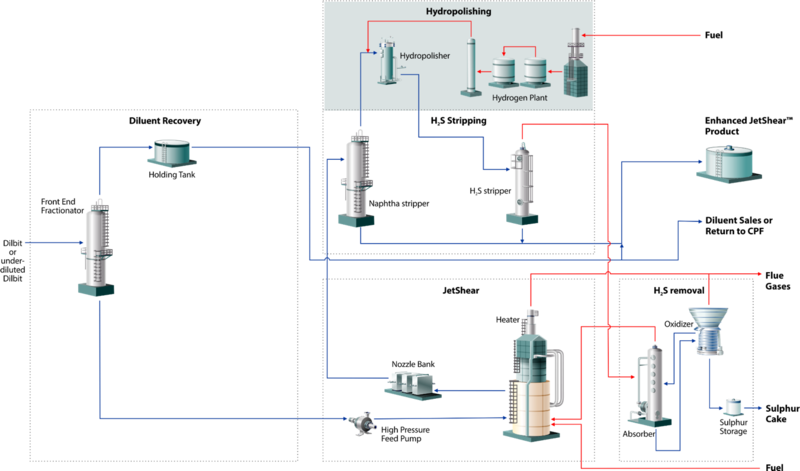 The naphtha cut is processed in a low pressure catalytic hydrogen polishing unit before being cooled and then blended with the final product. Higher diluent displacement is achieved when olefins content no longer limits the aggressiveness of the JetShear treatment conditions. 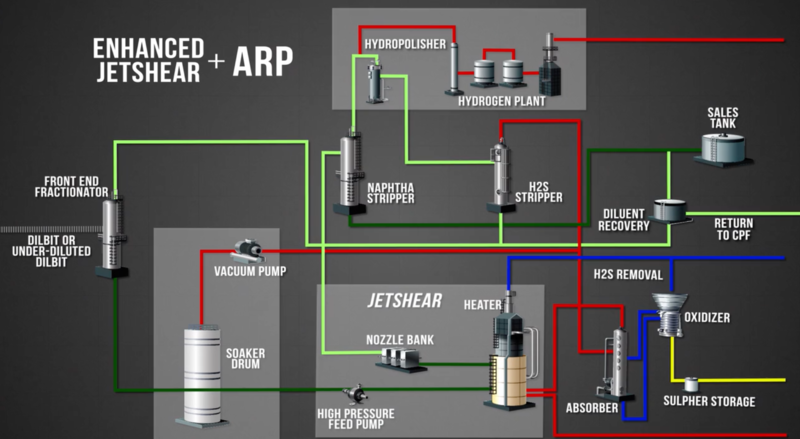 The ARP process consists of a simple configuration of pre-fractionation and a soaker drum with a heater. Acids are thermally destroyed at temperatures below the onset of cracking thereby reducing the Total Acid Number or TAN. Fractal’s JetShear technology is applied in the field or terminal where heavy oil or bitumen is blended with diluent for transportation via pipeline or rail. JetShear can dramatically reduce the amount of diluent that is otherwise required to transport the heavy oil to market. impact associated with transporting the heavy oil to market while at the same time having a negligible impact on volumetric yield. In addition, the stable JetShear products have other quality improvements including reduced density, sulfur, TAN and olefins content below pipeline specification. Tariff costs and environmental impacts are reduced due to reduced volumes being handled.